I’m a fan of writer / director Jeff Nichols and his other work (including the truly original “Take Shelter” and the fully engrossing “Mud“), but his latest effort didn’t work for me. The tone is very similar to Nichols’ earlier films and he stays true to himself when it comes to his inventive storytelling style and engaging filmmaking techniques. I give serious credit for the audacious originality and grand intentions of “Midnight Special,” but this movie just isn’t very entertaining. The mystery elements are especially critical in building a rich tension early on, and they are fantastic. These shrouds of mystery provided a compelling hook that kept me guessing, but the movie begins its downhill slide as more of the story is slowly revealed. This movie is pretty great for the first half then sadly peters out in yet another ambitious but unsatisfying conclusion that is reminiscent of “10 Cloverfield Lane” (“Midnight Special” reminded me a lot of that one, actually, especially how I thought the story was going in one direction but ended up doing a U-turn into another). The film sets a very high bar then ends with a yawn. The muddled middle is messy too, jumping around with plot elements including everything from a kidnapping, religious cult, fugitive escape, sci-fi fantasy, bloody shootouts, car crashes and government spies, with a little bit of “The X-Files,” “Tomorrowland” and “Big Love” thrown in for good measure. The movie feels like an attempt to reinvent the genre that has gone awry. (I’m not sure if the heavy-handed Superman allusions were intended to be tongue-in-cheek funny or genuinely serious). As usual, Nichols is able to elicit intense performances from his impressive roster of talented actors including Michael Shannon, Adam Driver, Joel Edgerton, Jaeden Lieberher, and Kirsten Dunst. Sadly, none of them truly made me care about the story or the characters. There’s no big payoff to the excellent set-up. This movie is just plain weird — and not in a good way. It plays more like a bad episode of “The X-Files” than a feature length movie. “Midnight Special” is an ambitious and auspicious science fiction work by experienced director Jeff Nichols (“Take Shelter,” “Mud”). 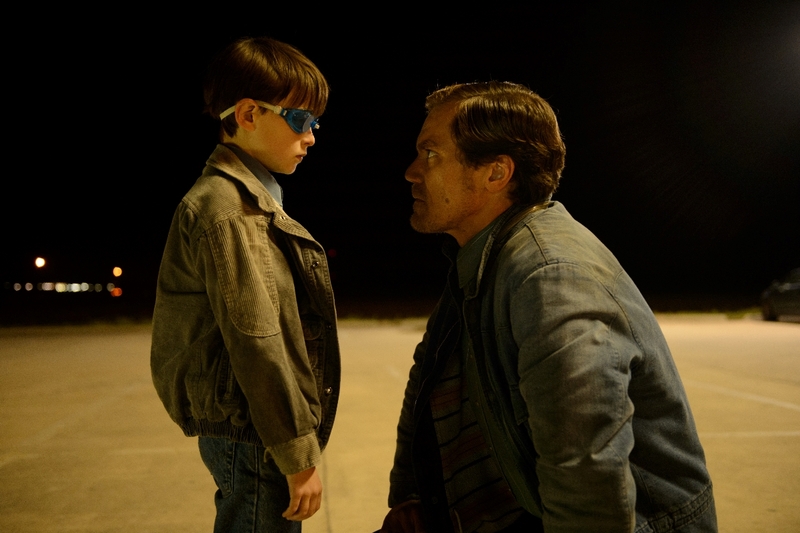 Supported by a strong cast featuring Nichols mainstay Michael Shannon along with Joel Edgerton, Adam Driver, and Kirsten Dunst, “Midnight Special” at various times can be riveting, and at other times head-scratchingly bizarre. Nichols’ experience as a director shows. As the movie opens, the viewer is immediately dropped into a kidnapping / standoff situation with Roy (Shannon) and Lucas (Edgerton) armed to the teeth with the young Alton (Jaeden Liberher) nearby. As we listen to the news report playing on the television, our perceptions of the situation and the type of men Roy and Lucas are quickly shaped – and our sympathies cast — only to have those views quickly challenged as we learn more and more about who these men are, and what Alton represents to them. It is these opening scenes (the first 20 minutes or so) where Director Nichols is at his best – weaving together elements of the story, thread-by-thread, until we finally feel grounded and aware of exactly what is going on, and decide with who our sympathies lie. This is “show, don’t tell” storytelling at its finest. Those first 20 minutes are shockingly engrossing and an example of some of the best directorial and editing work I’ve seen in recent memory. Unfortunately, the film can’t sustain its momentum. As story elements continue to unfold and the science-fiction aspects come into play, it loses a little bit of its effectiveness. We learn more about Alton, Roy, Lucas, Sevier (Driver) and Sarah (Dunst) and how they came to be in this situation. It is in these moments that the characters come into their own, but at the same time it is at these story points when the film loses ground. The look and feel of the picture has a gritty realism that, mashed together with some of the Warren Jeffs-inspired story elements feels ripped from the headlines. But then, we witness something fantastic and incredible that – while kinda cool – inevitably results in a disconnect between what’s come before and what we are watching now. These sci-fi elements all build together towards a big reveal that pushes the boundaries of credibility just a little too far. Don’t get me wrong – the movie is worth seeing for fans of the director, these actors, story-driven indie films, and science-fiction that is anything but cookie-cutter. It’s a solid film. It disappoints me only because (particularly given the strength of the first act) it could have been great. It’s not. Louisa, I agree with your assessment of this film. Although there were elements to admire about it, I just didn’t get it.